These are a few pictures from the works completed at Accrington Town Centre. The pictures are taken in front of the Market Hall and Town Hall. The area was transformed to commemorate the sacrifice and bravery of the Accrington Pals. Articulate design has been encompassed into the paving to show homage to the trenches used during the first world war. “I have been very impressed by NMS. The professionalism and quality of the workmanship you and your team have achieved on Accrington Town Square is superb. The execution of the detailing is fantastic, we are very happy with the whole square.” – Danny Marsh from IBI Group. The photography for this news article was provided by Hardscape Products Ltd.
Hardscape Products Ltd are responsible for the supply of paving and bench products. Please click here to see more pictures of the completed works. 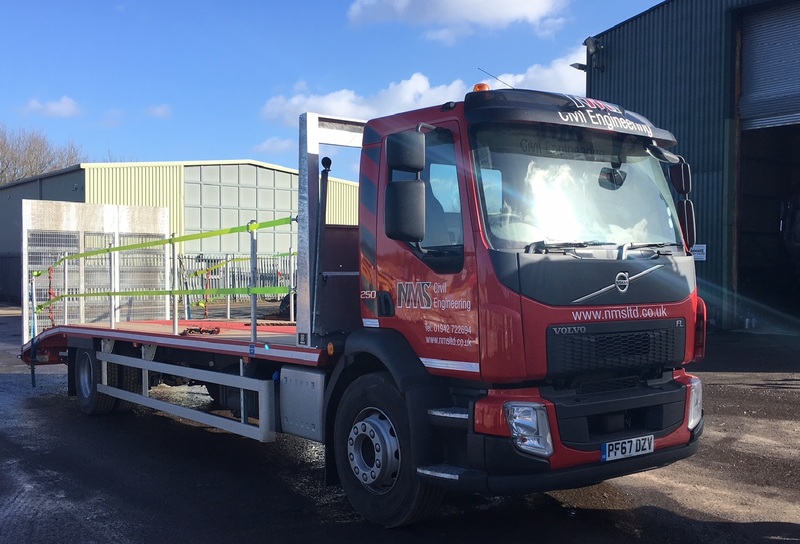 NMS have added a new Volvo Beavertail truck to the fleet. The new truck is a Volvo 4×2 FL with beavertail body with Euro VI engine. 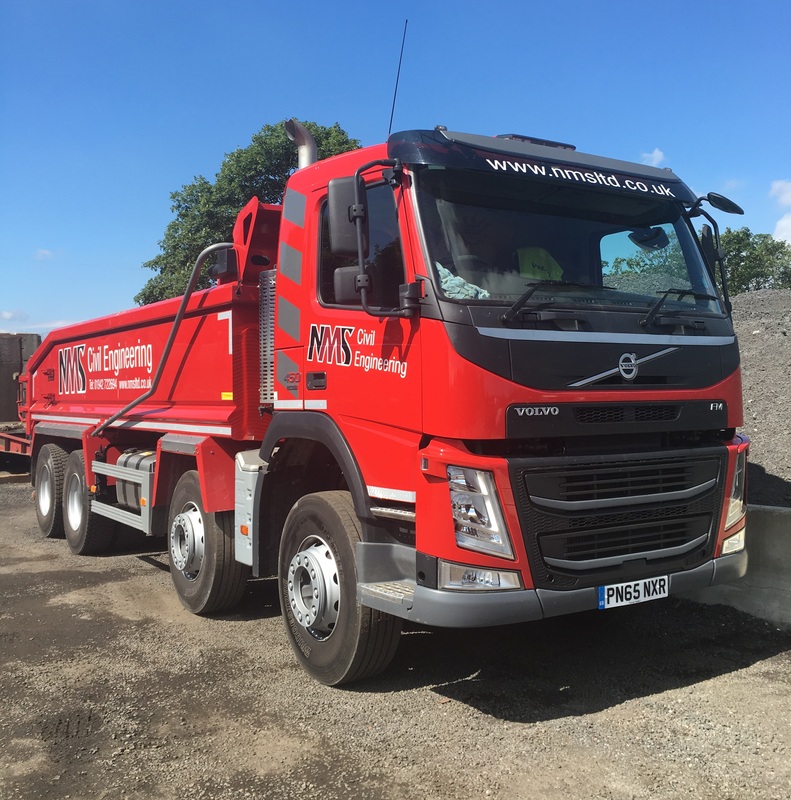 The Volvo FL series is the smallest Volvo truck works well in a wide range of applications, it is agile, efficient and easy to drive, it will be useful to transport smaller machines and plant to job sites which will be helpful to the planing and barrier divisons. FORS accreditation drives best practice across the European fleet industry in terms of safety, efficiency and environmental protection. Championing FORS’s work within fleet transport with help to raise standards of driving. 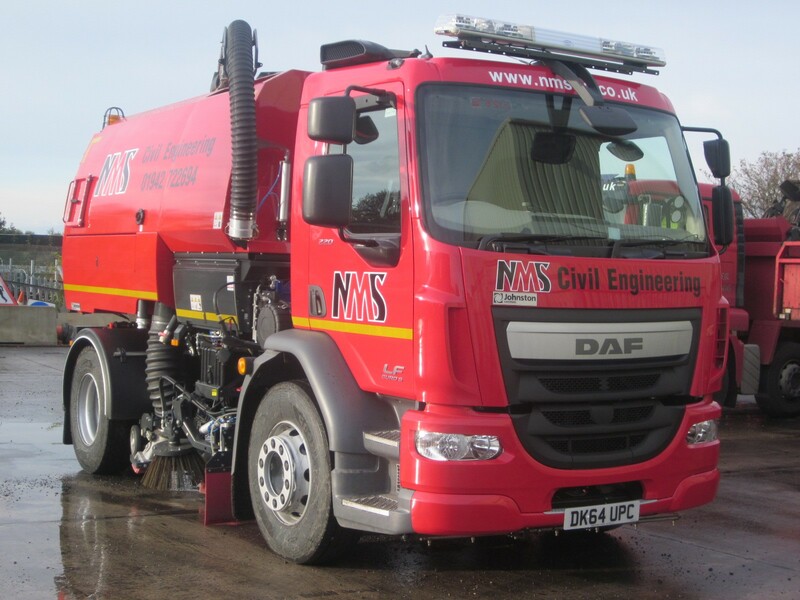 Bronze accreditation confirms that NMS employ good practice and comply with the requirements laid out by the FORS Standard. This includes demonstrating dedication to driver and vehicle safety, combined with improving operating practices through effective monitoring of fuel and tyre usage. L-R Annette Birch, THI Officer; Councillor Clare Cleary, cabinet member for Accrington town centre; Roger Thistlethwaite, managing director of NMS Civil Engineering; Hyndburn council leader Miles Parkinson; and Nick Stafford, LCC landscape team manager. Works on the historic £2 million public square in Accrington are set to begin this month after a contractor was appointed. Hyndburn council has awarded the contract to NMS Engineering Ltd from Wigan and the project is set to be completed by July 2018. The area in front of the Market Hall and Town Hall will be transformed to commemorate the sacrifice and bravery of the Accrington Pals. It will also include the restoration of historic, retail and commercial buildings in the town centre. The first phase of the works will target the public realm area before the second phase to restore buildings on Blackburn Road between Eagle Street and St James’ Street begins in the New Year. Coun Clare Cleary, cabinet member for Accrington town centre, said these are ‘exciting times’ for the town. She said: “I’m looking forward to seeing the works progress on site as a new phase of history unfolds, with the creation of a new town square and public realm scheme outside Accrington Town Hall and Market Hall to commemorate the Accrington Pals. “The Townscape Heritage Initiative team have worked hard to finalise the details of the scheme since the planning permission was granted in January this year. 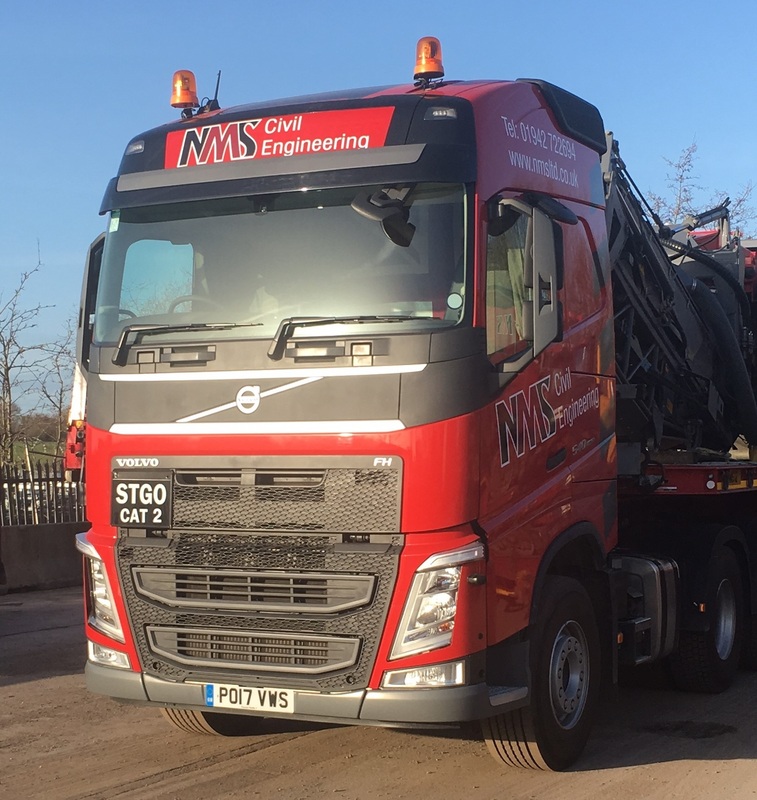 “A detailed tendering process has taken place and the team are pleased to announce that the contract has been awarded to NMS Engineering Ltd from Wigan. “Hyndburn Borough Council and Lancashire County Council (LCC) will continue working together to make the plans become reality over the coming months. Designs for the ‘simple, high quality and flexible’ square have been created by Landscape Architects IBI Group with funding secured from Hyndburn council, LCC and the Heritage Lottery Fund. 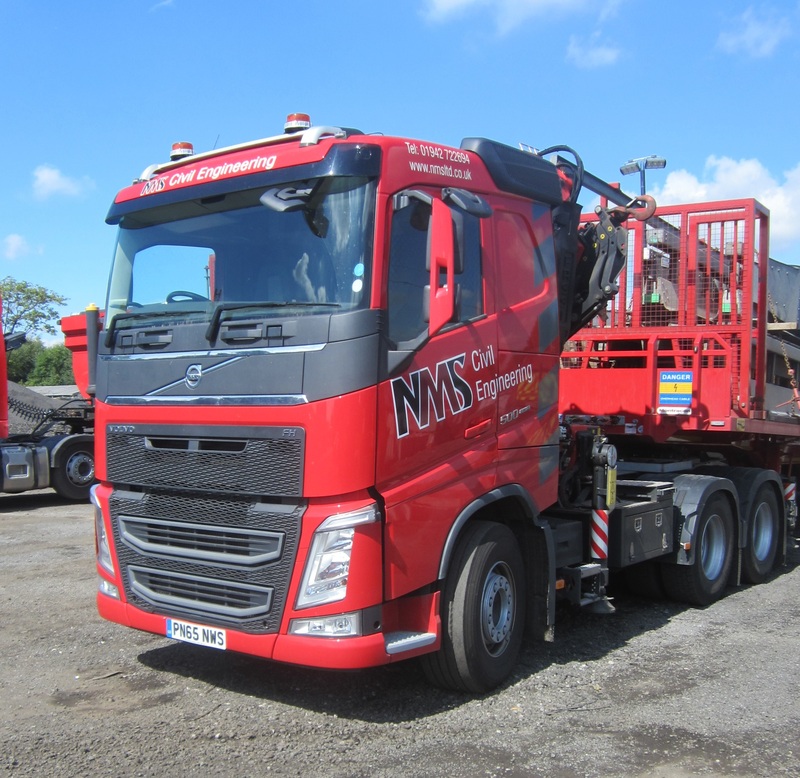 NMS welcome their newest member to the vehicle fleet, the Volvo FH 540 6×4 80T Tractor Unit. The Volvo FH Range is one of the most successful truck series ever and in September 2012, Volvo Trucks launched the Volvo FH with major technology upgrades, a new design and more. The Tractor Unit will be utilised within the planing division. r new Planer, the Wirtgen W220. The W220 is now the largest milling machine amongst the Planer fleet. An innovative feature of the W220 is that the milling drum speed can be adjusted which helps to cut down emissions. The W220 cuts at a width of 2.2m and can plane up to depth of 350mm. The Wirtgen W220 is operated with Wirtgen’s latest technology the WIDRIVE machine management system. The WIDRIVE machine management system has been able to reduce the amount of controls needed for the operator to aid easy handling. Additionally, the WIDRIVE optimizes fuel consumption as the economically efficient engine always works in the optimum performance and torque ranges. 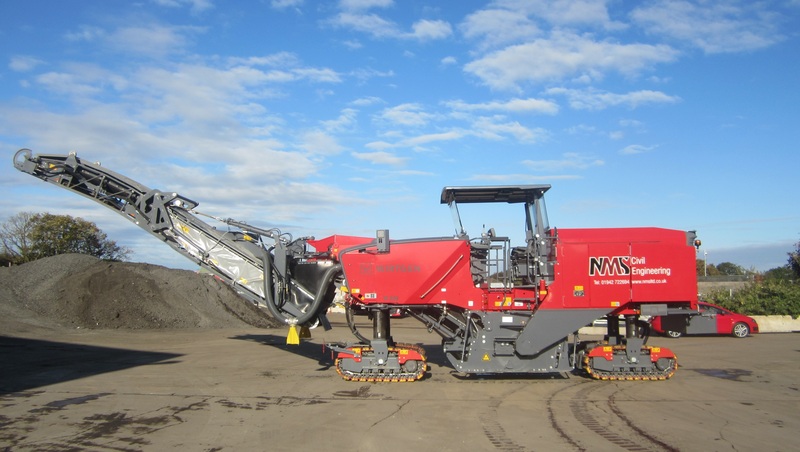 For more information on the W220 please click here to visit the Wirtgen website. For quotes and booking of the W220 or the rest of the fleet then contact Roger on 01942 722694. 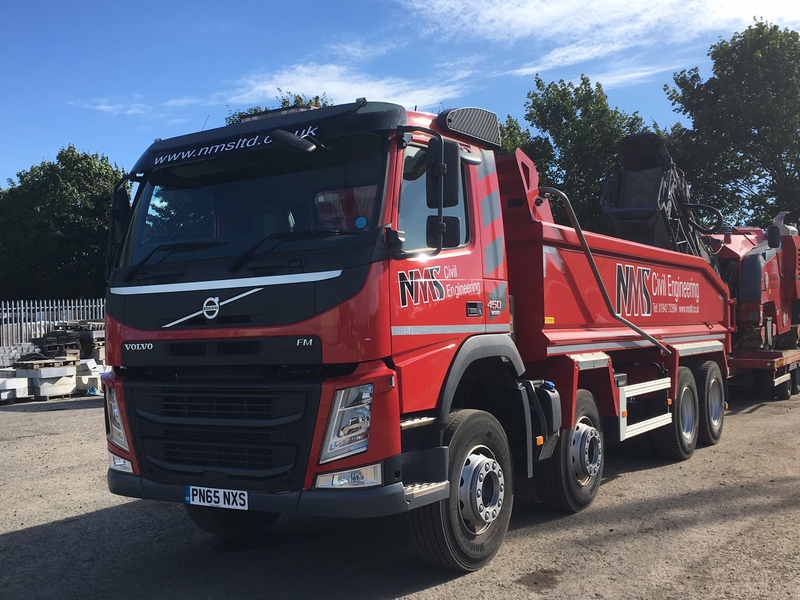 The Volvo FM450 8X4 tipper wagon is the latest recruit to the growing NMS fleet. Volvo have been continuously upgrading the Volvo FM series for over 10years with significant developments made in its fuel efficiency and improved stylish appearance. 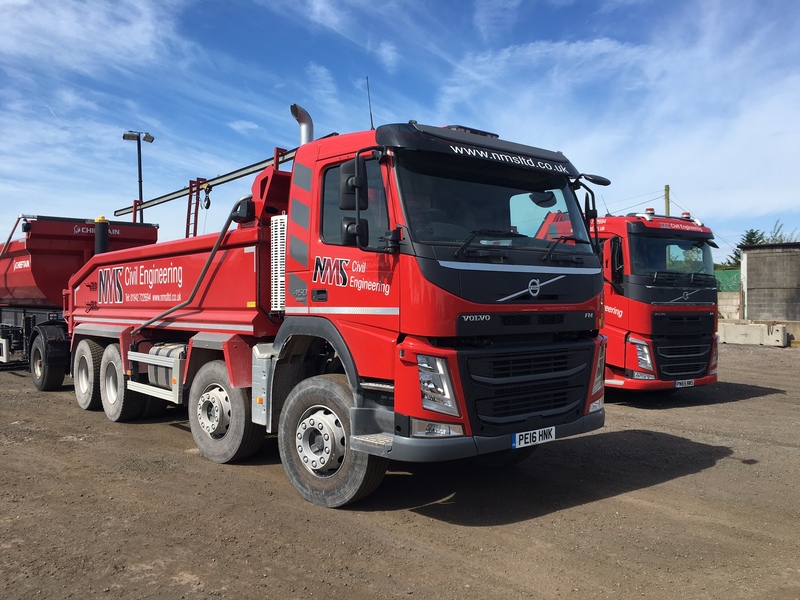 The Tipper will be a valued addition within the planing division. These vehicles come with the upgraded Euro 6 engine that reduces the emissions and particulates while maintaining its fuel economy. Both 8 wheeled road wagons are valued additions to the vehicle fleet and have been painted with a new modern design that make them more aesthetically pleasing to the eye. This investment is a product of the Volvo FH series. The new Volvo FH500 6X2 rear tag 3-axle Tractor Unit with Fassi Crane F485RA.2.24 (see picture below). The Tractor unit is a product of the Volvo FH series and the articulating crane is a continuous rotating crane and complete with European Compliant safety devices to assist with safe loading and unloading. The Crane unit is a key feature within the barrier division. The Road Sweeper is another V651 Johnston’s Roadsweeper following the success of the first sweeper introduced last year. The V Range has established itself as Johnston’s most reliable and dependable truck mounted sweeper. The sweeper is the most recent addition to the fleet and will be a valued asset to be used within the planing division. For more information on the sweeper or any member of the fleet please contact Roger on 01942 722694.